Confront Dangerous Drivers? 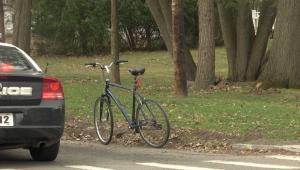 NOT A Good Idea…..
Bicyclists are back on our potholed Twin Tiers roads, and in addition to navigating around bad road conditions, we have to be mindful of the drivers around us. We’ve all gotten angry at thoughtless or careless drivers, and in that moment, did we confront? That’s a dangerous place to be. Every bicyclist has at least one story (and usually many more) about careless, aggressive, and impatient drivers who have cut them off, turned in front of them, almost doored them, often without thinking about our safety. Bicyclists are invisible and insignificant to millions of drivers. 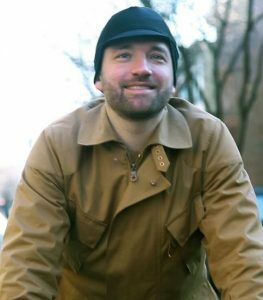 Eben Weiss, the author of the book “Bike Snob” and the blog Bike Snob NYC, has a great column in Outside magazine where he talks about the spur-of-the-moment decision all cyclists have to make when we’re wronged: Do we confront or let it go? He’s right. 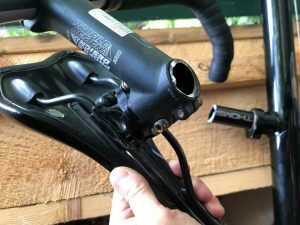 With thousands and thousands of miles of cycling experience, I have had more than my fair share of encounters with angry motorists who apparently feel that bicyclists have no right to share the road. I have had things thrown at me, I have suffered dangerous brush-backs (also known as “punishment passes”), and I have been screamed at at close-range by teens trying to scare the bejeezus out of me. I would like to say I have always reacted with calmness and good cheer. I have f-bombed, I have given the finger, I have encouraged the cowardly, menacing drivers to have the guts to come back and confront me without the protection of their thousand pounds of steel armor. With one exception – thankfully, a stoned 90-pound woman – no one has taken me up on the offer to come back. But I have been lucky so far. And luck only works for so long. So I have now reformed my ways. No longer do I confront motorists and I STRONGLY urge cyclists to NOT confront motorists under any circumstances. The bottom line is that any confrontation with a motorist could go wrong in so many way — a gun, a knife, a tire iron, the cyclist run over, etc. So the much smarter way to handle a nasty driver is to let it go and immediately report it to the police. No matter how justified, ultimately it’s never satisfying to fly into a rage; if anything, you just wind up feeling guilty and ashamed, like when you wake up on the couch covered in Cheetos after a Netflix binge. As for administering a devastating dressing-down with such surgical precision that the driver immediately questions all the life choices that led them up to this moment, no matter how clever you are, attempts to deliver the mot juste invariably backfire and leave you feeling even angrier. I agree, Eben. Pick your fights! This entry was posted in Bicycle Accident Cases in Court, Bicycle Accidents, Bicycle Collisions, Bicycle crashes, Bicycle Safety, Bike accidents, Bike collisions, Bike crashes, Uncategorized and tagged accident attorney, accident lawyer, Bicycle, bicycle accidenet laws, bicycle accident attorney, bicycle risks, Bicycle Safety, bike accident, Cycling, Elmira, Elmira New York, Jim James B. Reed, Jim Reed, New York, New York bicycle accident lawyer, ny bicycle accident, ny bicycle accident lawyer, ny bicycle cases, pa bicycle accident, pa bicycle accident lawyer, pa bicycle law, Twin Tiers, Ziff Law Firm on April 8, 2019 by Jim Reed. Sad to say but it appears to be open season on bicyclists in New York City. So far this year, in less than three months, 7 cyclist fatalities. In the last week alone, two very experienced bicyclists were struck and killed. NYC police said a total of 10 bicyclists were killed in the city’s boroughs in all of 2018, so 2019 is looking like a much more deadly year for cyclists. Some bicycle advocates are estimating that there could be 30 or more deaths this year on NYC streets. And there are real steps the city — and all cities — can take to protect bicyclists from some of the hazards. On March 14, 53-year-old Robert Spencer was killed just blocks from his home in Long Island City. Police did not identify the 51-year-old female driver who struck him but said the investigation continues. On March 17, 66-year-old David Schlichting was struck and killed by a hit-and-run driver on Long Island. Both were described as experienced and careful cyclists. Bicycle advocates in New York City called for the city to move quickly to install bike-centric infrastructure across the five boroughs. > Police and neighbors said Spencer was struck in an uncompleted bike lane. Residents living near the crash scene recently requested a two-way protected bike lane near the intersection where he was killed. “DOT will look into potential safety enhancements, as we do following any fatality,” a city Department of Transportation spokeswoman told the news media. The DOT also said it would implement areawide traffic-calming measures around the crash scene and will re-examine existing construction projects to ensure the paths are safe. Spencer’s family and friends held a weekend vigil and placed a ghost bike at the crash scene. > Schlichting was struck by a minivan driver who fled the scene and remains at large, police said. 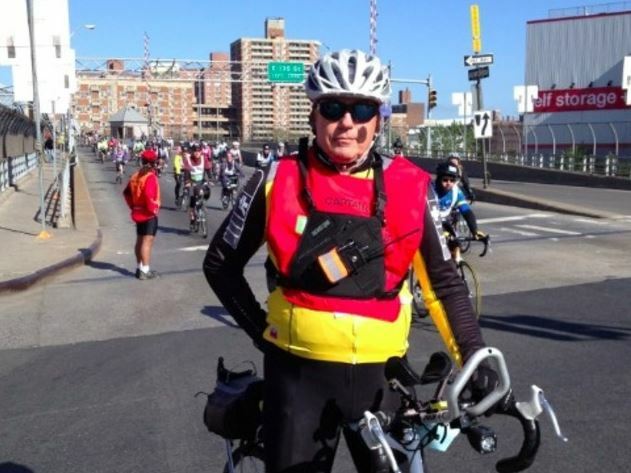 Friends told the news media that Schlichting had been involved in the cyclist community for decades, beginning with his volunteer work with the American Youth Hostels nonprofit, which for much of the 1960s and 1970s organized bike trips in the city. In the 1970s, the group became the Five Borough Bicycle Club and Schlichting helped launch the Five Boro Bicycle Tour, an annual 40-mile ride that remains the country’s largest gathering of cyclists. He also helped lead multiple safety and educational campaigns for fellow cyclists. Please ride safely out there……. This entry was posted in Bicycle Accidents, Bicycle Collisions, Bicycle crashes, Bicycle Laws, Bicycle Safety, Bike accidents, Bike collisions, Bike crashes, Fatal bicycle accident, Hit-and-run accidents, Risks for Bicycle Riders, Uncategorized and tagged accident attorney, accident lawyer, bicycle accident, bicycle accident attorney, bicycle risks, Bicycle Safety, bike accident, Cycling, Elmira, Elmira New York, James B. Reed, Jim Reed, Law, Lawsuit, New York bicycle accident lawyer, New York City, ny bicycle accident, ny bicycle accident lawyer, ny bicycle cases, pa bicycle accident, pa bicycle accident lawyer, pa bicycle law, Twin Tiers, Ziff Law Firm on March 19, 2019 by Jim Reed. It’s great to see longtime Elmira business owners – and longtime champions for downtown – work together to promote a great business and help a local agency that serves people with disabilities. It’s an inspiring story that resulted in the production of a terrific video (above) promoting the Twin Tiers’ premier bicycle shop — and a downtown with new energy. Rich LaVere, the owner of Nutmeg Upcycling on West Gray Street, recently helped promote Kingsbury’s Cyclery, the great bicycle sales and service shop owned by Paul Kingsbury on West Water Street, by overseeing the production of a six-minute video that does a professional job of profiling Paul and his shop. Rich worked with Kyle, an Arc of Chemung client, to make the video. Paul has been in business at various locations in the Elmira area since 1981, when he was 20 years old, and has been downtown for about 30 years. Rich, a talented photographer and videographer, is the owner of LaVere Media, which was in the Midtown building on North Main Street for years. He closed that storefront a few years ago, but cameras are still Rich’s first love. Now he’s channeling some of his creativity into “upcycling” used items that he transforms into one-of-a-kind originals in his cozy shop under the Mark Twain Apartments, and using his creativity to give back to the community he loves. Rich was approached by the Arc of Chemung to serve as a mentor for Kyle, who has an interest in animation and filmmaking. Kyle filmed and edited the video with Rich’s guidance. Rich suggested that Kyle create a “mini-documentary” about Paul’s shop to highlight a longtime downtown business. Rich helped Kyle with some basic video skills and guided him in expressing his ideas visually. Rich said Kyle did the principal videography, choosing his own shots and style, and they worked together during the editing process, with Kyle making most of the editorial decisions. This entry was posted in Cool Stuff for Bicyclists, Uncategorized and tagged accident attorney, accident lawyer, Bicycle, bicycle accident, bicycle accident attorney, Bicycle Safety, Cycling, Elmira, Elmira New York, James B. Reed, Jim Reed, Lawsuit, New York bicycle accident lawyer, ny bicycle accident, ny bicycle accident lawyer, pa bicycle accident, pa bicycle accident lawyer, pa bicycle law, Twin Tiers, Ziff Law Firm on March 13, 2019 by Jim Reed. Sometimes, a 10-year-old boy can be more responsible than a 66-year-old man. 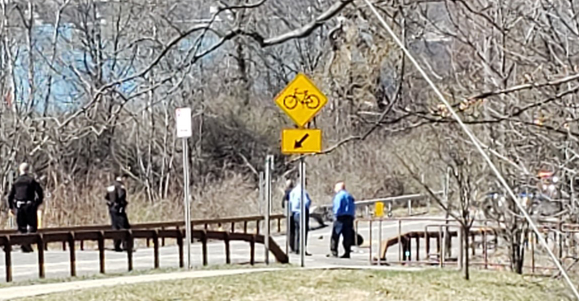 That was the case last fall in the aftermath of a car-bike crash in the Rochester suburb of Pittsford, according to a report this week in the Rochester Democrat & Chronicle newspaper. 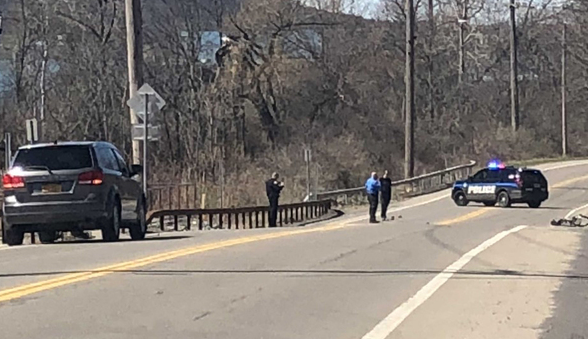 The boy, 10-year-old Julian Moore, was riding his bike in his neighborhood on Sept. 7 when he was struck by a Range Rover being driven by 66-year-old Doug Lamb of Canandaigua, Lamb had left nearby Oak Hill Country Club after a round of golf and was driving a borrowed Range Rover. Although Lamb stopped after Julian crashed to the pavement, he left before police arrived. He didn’t identify himself to anyone at the scene, not Julian or his mother, Jenny Moore, who was called to the scene, or paramedics or witnesses. Police said he also never reported the crash to the authorities. Julian suffered only scrapes and bruises and was later diagnosed with a concussion, his mother said. It took investigators two weeks to track down Lamb at his lakefront home and charge him with Leaving the Scene of an Accident Causing Personal Injury, a misdemeanor. Lamb told police he checked on Julian, waited for 30 minutes at the scene, and left after Julian’s mother declined treatment for Julian. He told investigators he didn’t think he was needed anymore. Police reports, however, provided a different timeline. The ambulance was called at 4:54 p.m., arrived at 5:02, and police arrived at 5:12 – and Lamb was already gone when police arrived. That’s way less than the 30 minutes he claims he waited at the scene. Regardless, under NY law, a driver involved in a personal injury crash is prohibited from leaving the scene until the police arrival no matter how long it takes for the police to arrive. 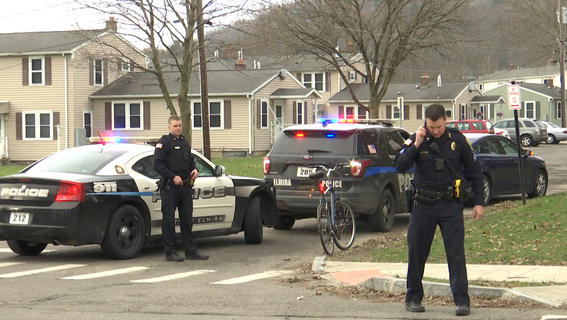 A plea deal was struck in Pittsford Town Court on Dec. 6. Prosecutors wanted Lamb to perform community service and write a letter of apology to Julian, and Lamb wanted the charge dismissed. Town Justice John Bernacki rejected community service, citing Lamb’s age and physical condition – despite the fact that Lamb was playing golf prior to the crash. Judge Bernacki agreed to dismiss the charge if Lamb wrote an apology to Julian, but it was Lamb’s “apology” letter that hurt Julian more than the collision with the Range Rover. I’m very sorry that you rode into the side of the car I was driving on Friday, September 7th. More importantly, I am glad you didn’t need to be treated by the attending ambulance on the day of the incident. Wishing you a safe and happy holiday season. Sincerely, Doug Lamb. The Lamb case was “adjourned in contemplation of dismissal” (ACD) on the condition that Lamb write an apology letter. So the question now for the town justice is: Was the non-apology letter enough to dismiss the charge? The newspaper columnist who wrote the story said what Lamb wrote “was an insult to the court. The court deserves better, and so does Julian.” I wholeheartedly agree. As the columnist pointed out, the 10-year-old accepted responsibility for his part in the collision but the adult driver refused to accept responsibility for running over a bicyclist. The court has six months to reconsider the dismissal. A hearing is scheduled this week in town court to discuss the case. This entry was posted in Bicycle Accident Cases in Court, Bicycle accident lawsuits, Bicycle Accidents, Bicycle Collisions, Bicycle crashes, Bicycle Safety, Bike accident lawsuits, Bike accidents, Bike collisions, Bike crashes, Risks for Bicycle Riders, Uncategorized and tagged accident attorney, accident lawyer, Bicycle, bicycle accident, bicycle accident attorney, bicycle risks, Bicycle Safety, bike accident, Cycling, Elmira, Elmira New York, Injury, James B. Reed, Jim Reed, Lawsuit, New York, New York bicycle accident lawyer, ny bicycle accident, ny bicycle accident lawyer, ny bicycle cases, pa bicycle a, pa bicycle accident, pa bicycle accident lawyer, pa bicycle law, Twin Tiers, Ziff Law Firm on January 17, 2019 by Jim Reed. Another graphic & painful crash video…….. This video illustrates (sadly again….) that cell phones and driving do NOT mix. Ouch!!!! This entry was posted in Uncategorized on October 8, 2018 by JimReed. The City of Elmira is going Lime, too. The city will soon have ride-sharing bikes and electric scooters from LimeBike, a ride-sharing company that people will be able to access from their smartphones and other ways. Watch for more details soon in the local news media now that Elmira City Council this week cleared the way for the popular ride-sharing company to hit the streets. We’ll see the lime green bikes popping up soon, perhaps even this month. LimeBike is already in Watkins Glen, Montour Falls, and Ithaca. I wrote about the arrival of LimeBike in Watkins Glen here. As THE bicycle law expert in Upstate NY, the Star-Gazette called me this week to comment for a story that was on the front page (photo at left). I told the reporter that, as a longtime Bike Law lawyer, cycling enthusiast and racer, I love any program that gets more people on two wheels on our roadways. More riders means less congestion of vehicles, a healthier population in general, and I hope, when people get back in their vehicles after LimeBiking, they will be more tolerant and patient with cyclists and approach us with respect and a willingness to share the road safely. Watkins Glen Village Trustee Laurie DeNardo told the Star-Gazette that the village has been happy with LimeBikes this summer. The village had 4,000 LimeBikers travel 8,200 miles from May through Oct. 1, she said. 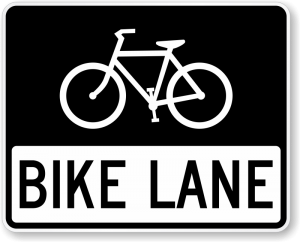 Bicycles have the legal right to ride in the road and even have the right to use the full lane when turning left or when it would otherwise be unsafe to ride to the right of the road. Riders 14 and younger must wear a helmet. I recommend a helmet for all cyclists. 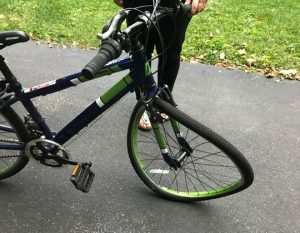 At this time, unlike some other local cities, Watkins does not have a law prohibiting bicycles from riding on the sidewalk, so legally, bikes may be operated on sidewalks. However, both bicyclists and pedestrians sharing the sidewalks must be respectful of one another and should walk/ride safely so they don’t endanger others. Motorists are legally required to treat a bicyclist like any other vehicle (i.e.. yield the right of way to a bicyclist already within an intersection, yield to a bicyclist coming toward you if you are making a left turn across their path). 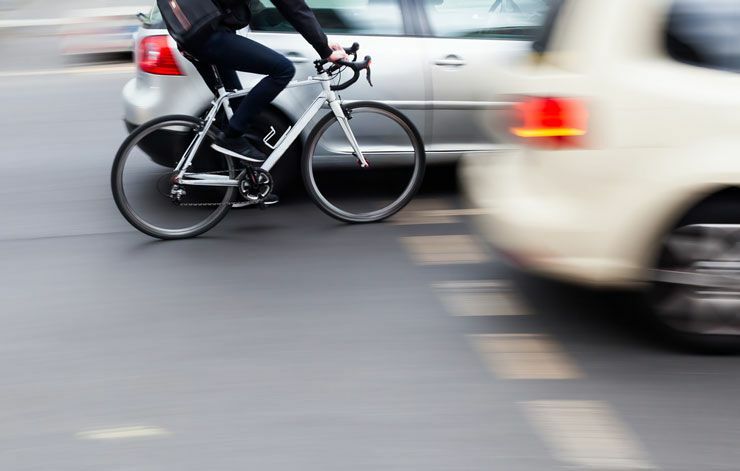 Motorists need to observe a “safe passing distance” when passing a bicyclist. Motorists and cyclists need to look out for one another and observe the local and state laws in place to ensure that LImeBikers, and all cyclists, have an enjoyable and safe ride. This entry was posted in Bicycle Laws, Bicycle Safety, Bicycle sharing program, Bike sharing program, Cool Stuff for Bicyclists, Risks for Bicycle Riders, Uncategorized and tagged accident attorney, accident lawyer, Bicycle, bicycle accident, bicycle accident attorney, bicycle risks, Bicycle Safety, bike accident, Cycling, Elmira, Elmira New York, James B. Reed, Jim Reed, Law, Lawsuit, New York, New York bicycle accident lawyer, ny bicycle accident, ny bicycle accident lawyer, pa bicycle accident, pa bicycle accident lawyer, pa bicycle law, Twin Tiers, Ziff Law Firm on October 3, 2018 by Jim Reed. 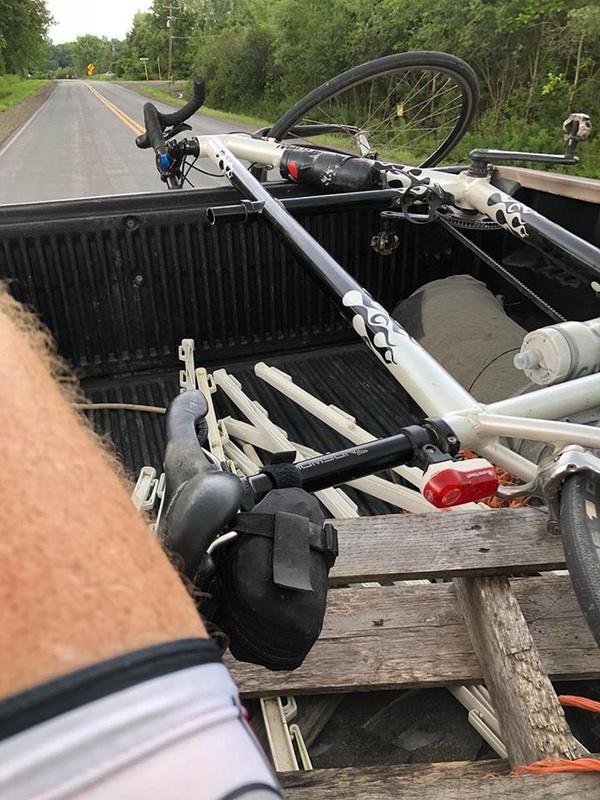 This is how my ride ended……in the back of a pickup truck driven by Rusty, a local Good Samaritan, who made sure Meg and I got home safely after our tandem seatpost unexpectedly failed causing us to crash. My wife, Meg, and I have been riding together on a tandem bicycle for 20 years. We ride single bikes most of the time, but the tandem gives us a great way to share our passion for cycling and spend time together enjoying the beautiful Finger Lakes countryside. My seat post also held Meg”s handlebars until they sheared off. 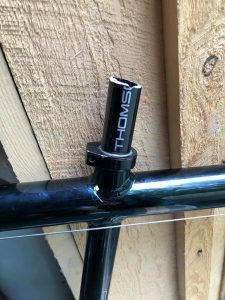 We are lucky to be alive, though, after our tandem suffered a major structural failure that sent us crashing to the road on Aug. 19 during one of our rides. It was a terrifying few minutes we will never forget, followed, very fortunately, by the kindness of a Good Samaritan named Rusty who saved the day for us. Before Rusty arrived, though, it was just Meg and I riding on Logan Road in the Town of Hector, a road we have ridden hundreds of times. We were about five miles from our home after riding about 25 miles. I had visually inspected our tandem before we left our house. We had just returned from a week of riding the roads of Vermont together, where we traveled about 75 miles a day on the tandem. The dependable and rugged seven-year-old tandem appeared to be good shape. In the seconds before we crashed, we sped through a steep downhill part of Logan Road at 35 to 40 miles per hour so we could build momentum for a steep incline just ahead. It felt like a routine ride for us. The bottom of my seat shows where the post broke off. But as we climbed the steep incline gradually slowing as we reached the crest of the hill, I felt an awkward movement from Meg, and then the bike pivoted sharply to the left. Meg’s handlebars (and my seat post) had broken off in her hands and we lost the ability to control the bike. The next thing I knew, we were both on the pavement and one of Meg’s elbows was bleeding. I quickly moved Meg to safety, well off the road, and checked her injury. She was in pain, but suffered no serious injuries. I was fortunate to escape any injury. I moved the bike off the road and, as I was preparing to call one of our neighbors for a ride home, Rusty drove by. He passed us at first, probably not seeing us right away, but he backed up and asked if we needed help. Once I explained what happened, he helped us pile our broken tandem into the back of his pickup truck. He offered to take us to the Hector Fire Department to have the EMT on duty look at Meg’s injury, but we declined, so we headed back to his farm so he could get his bigger pickup truck, and from there, we were home in minutes. Rusty took a chance on us, welcoming two banged-up strangers into his truck without hesitating. His compassion reminded us – once again – how lucky we are to live in the Finger Lakes where it’s not at all uncommon for locals to graciously help one another. Meg and I offer our thanks to Rusty and the many other Good Samaritans in the Finger Lakes who don’t think twice about helping a stranger in need. A version of this story has appeared in The Odessa File. This entry was posted in Bicycle Accidents, Bicycle crashes, Bicycle Safety, Bike accidents, Bike collisions, Bike crashes, tandem bicycles, Uncategorized and tagged accident attorney, accident lawyer, Bicycle, bicycle accident, bicycle accident attorney, bicycle risks, bike accident, Cycling, Elmira, Elmira New York, James B. Reed, Jim Reed, New York, New York bicycle accident lawyer, ny bicycle accident, ny bicycle accident lawyer, pa bicycle accident, pa bicycle accident lawyer, pa bicycle law, Twin Tiers, Ziff Law Firm on September 13, 2018 by Jim Reed.